Here’s my nomination for the easiest frittata ever: Frittata al basilico, or Fresh Basil Frittata. It is literally simply beaten eggs mixed with a fistful of grated cheese and lots of fresh basil leaves. 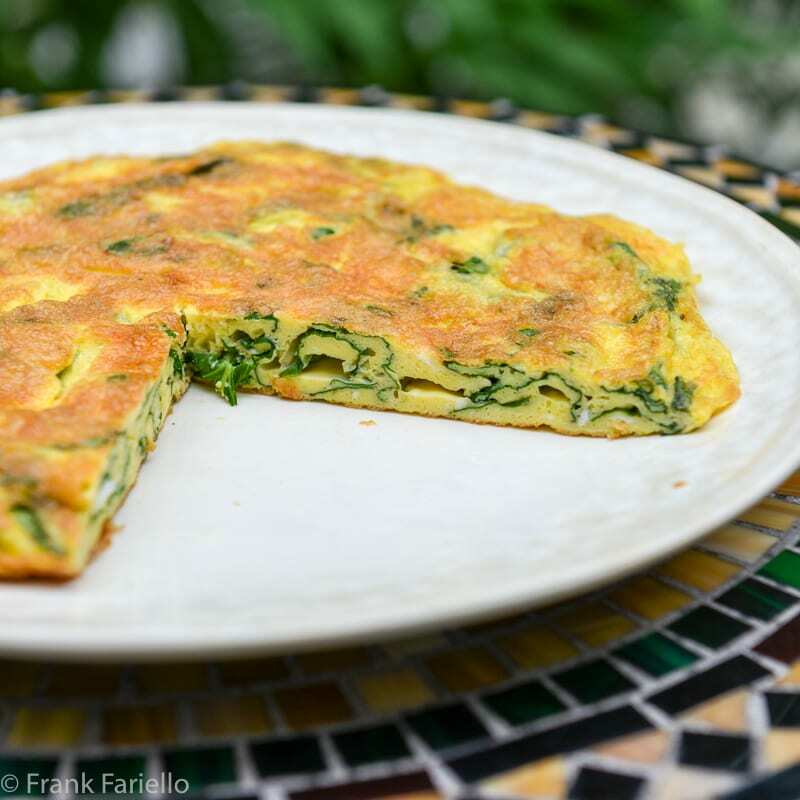 It’s perhaps my favorite summer frittata, whipped up in 15 minutes or less, full of aromatic flavor and, I would dare say, a lovely sight to behold with its contrasting green and yellow striations on the inside and golden crust outside. A Fresh Basil Frittata is equally nice as a light main course or, cut into small squares or wedges, small bites to accompany cocktails. Beat the eggs in a mixing bowl, add the grated cheese, salt and freshly ground pepper. Then gently fold in the basil leaves, tearing the larger leaves into pieces. Add the egg mixture into the hot oil, turn down the heat to medium-low, and proceed following the usual technique for making a frittata, frying one side until the eggs have nearly set and developed a light golden brown crust, then flipping the frittata over and browning the other side as well, until the eggs are fully cooked through. The process will take about 5 minutes for the first side, perhaps 3 minutes for the second, give or take, depending on thickness. Slide the frittata onto a serving plate. Let it cool a bit (or entirely) before slicing and serving. Like all frittatas, this one is best eaten either warm or at room temperature, not scalding hot. A few minutes’ rest to cool before serving improves both flavor and texture. Cooking time will depend largely on the number of eggs and the size of your skillet. For the rather thin frittata you see in the photos here, I used 7 eggs fried in a medium-sized (26 cm/10 inch) skillet. More eggs or a smaller skillet would produce a bit thicker result. But since basil leaves are not at all bulky, a Fresh Basil Frittata will tend to be rather thinner than say, one filled with potato and sausage. You can achieve all sorts of nuanced variations by subbing ingredients and adjusting measurements. You could make a “sweet” version of a frittata al basilico by subbing Parmesan for the pecorino and butter for the olive oil. By contrast, that pinch of red pepper flakes would add an extra kick to the already piquant pecorino. Recipes vary on the amount of cheese, from a couple of spoonfuls as here—where the cheese plays a supporting role—to quantities so large that the cheese rises to “co star”. And in one very common variation, cherry tomatoes, cut in half, are added to the egg mixture, either as is or lightly sautéed with onion just until they begin to soften. In this case your frittata al basilico will become a frittata con pomodoro e basilico. If you want to something more substantial, some sautéed crumbled sausage or pancetta would do the trick. I like to keep the basil leaves whole, tearing only the very largest leaves into pieces. But some recipes have you tear or cut the leaves into small pieces—or even shred them. I suppose the idea is the flavor will more evenly diffuse into the egg. Personally, I like more variation in my food. Some bites will be full of basil, others will have just a hint. Non-stick skillets are wonderful for making frittatas and other egg dishes. Eggs are sticky things and you risk a real mess if you try to cook them in a regular stainless steel pan. (Poached eggs would be the exception of course…) They’re also a breeze to clean. But non-stick skillets do have their drawbacks. For one, sooner or later they lose their non-stick qualities, often within a year of purchase—which is why I have stopped buying expensive non-stick cookware. And there are questions about the health risks of non-stick cookware, especially Teflon. Besides eggs and similar dishes like pancakes, carbon steel is wonderful for high-heat cooking like searing meats, just as good in my opinion as cast iron. Beat the eggs in a mixing bowl, add the grated cheese, salt and freshly ground pepper. Then fold in the basil leaves, tearing the larger leaves into pieces. Heat a skillet (non-stick or seasoned carbon steel, see Notes below) and cover the bottom with olive oil. Add the egg mixture into the hot oil and proceed following the usual technique for making a frittata, frying one side until lightly golden brown, then flipping the frittata over and browning the other side, until cooked through, about 5 minutes per side. Sage sounds delicious, too, Graziano. Going to give it a try, soon! This is a perfect way to use some of my basil as the weather is very hot and I don’t know how much longer I can keep it going. Looks wonderful Frank! We’ve turned into big frittata fans…simple to make and such a lovely meal in the summer…and how can you go wrong with fresh basil? My crop is a little slow off the mark this year as I wasn’t able to sow the seeds until the beginning of June…being somewhat pre-occupied in Italy! And the weather here this past month has been cool…not friendly to basil…When I thin the seedlings I toss them on sliced tomato salad! ho rivoltato per anni la frittata con un coperchio unto di olio per farla scivolare senza problemi ma ultimamente cuoci la frittata da una parte , poi spengo il gas e copro. Dopo qualche minuto il lato sopra sarà cotto con il vapore della frittata stessa in maniera più leggera. Mi ritrovo un lato croccante e uno morbido, a me piace molto fatta così. La prossima volta la provo al basilico e pecorino come suggerisci tu, grazie ! Mi interessa il tuo metodo, Chiara. La prossima volta che mi faccio una frittata la provo “alla Giglio”…. I do the same: good method, in fact I keep the lid all the time on: the frittata stays very moist + on the other hand, the broiler method is good too: for a nice crust.. so many choices! I haven’t done a survey so I can’t compare brands, but my set is from de Buyer and I’m very happy with them. put the pan under a pre-heated broiler for a few minutes. With luck it will rise up slightly, like a soufflé, and the bottom will still have the nice golden crust. Delizioso! Yes, I do it that way too sometimes, Steve! I’d never have thought to use just basil in a frittata! Nice! I also must say that it’s so great to see a frittata recipe that is just cooked in a pan and not in the oven. So many people bake their frittate!! It’s no longer a frittata if you are baking it! Ugh. We often have a nice frittata for late lunch or a light dinner and with my garden overflowing with fresh basil this recipe is ideal. I enjoy frittata cut into small slices to be served with an aperitivo before dinner as well, Basil Frittata would be oh so delightful with a chilled glass of prosecco poolside. I really should try carbon steel… just so afraid of failure! Funny story – I get your posts and my Cocoa & Lavender address and Mark subscribes at our home address. This cake in just before the weekend and we told the other we had an idea for supper one night. Your basil frittata! Then we came to the sad realization that we had only two eggs. We remedied that and made this – fantastic and light and fresh and flavorful. Thanks for our new quick & easy summer supper! Nice! So glad you both liked it. :- Now on carbon steel, you really have nothing to be afraid of, I’m absolutely sure of it. It handles much like cast iron, only lighter, making jobs like frittatas that much easier. This frittata sounds a whole lot like what I make for lunch on a regular basis! I just scramble an egg, add a bit of cheese and then toss in a fresh basil leaf or two. But if I just scaled this up and cooked it slightly differently, I would end up with this frittata…and I might just have to try it out soon. Great recap of pans here, too! Certainly does sound a lot like this, David. I’m going to try your scrambled eggs some time, I’m sure they’d be delicious. I just started making frittatas, I can’t wait to try your version. Hope you like it, Gerlinde! Please tell me how you flip a frittata. I always make a mess even when I cut it into fours and flip each quarter individually. Check out this post for the basic recipe for making frittata, which includes several different methods for flipping it. But, in a nutshell the usual way I do it is to slip the partially cooked frittata on to a plate (cooked side still down) then cover the plate with another plate, then holding the two plates together with both hands flipping them over, the slipping the frittata back into the skillet, this time uncooked side down. It’s easy. You get two plates dirty, but there’s almost no room for messing up. And the most foolproof method of all: don’t flip the frittata, just run the uncooked top under a broiler until the egg is completely cooked through and golden brown on top. It’s kind of “cheating” but it works! I buy my nonstick stuff at restaurant supply houses — you can buy decent quality really inexpensively there. I’ve got plenty of stainless and cast iron skillets, but don’t have a carbon steel one. Why not, I don’t know. I’ve been thinking for the last couple of years that I really need to get one and experiment with it, and your post has pushed me a little but in that direction. I do know the advantages — just haven’t experienced them for myself. Anyway, I LOVE frittatas — such a great dish. Never made one with basil, though, for some reason. And we have tons of the stuff in our garden this year — been harvesting it almost daily (it’s really growing like a weed — just amazing production). This would be a good use for that. Thanks! If you’ve got a surfeit of basil, this would be one great way to use it up! I think you’d really enjoy cooking with carbon steel, especially if you’re already using cast iron. Carbon steel is pretty similar except it much lighter so you can flip the skillet, for example. And because it’s thin, it doesn’t retain heat, so you can raise and lower the temperature almost instantaneously. That property makes it better for making eggs, for example, in my opinion. And carbon steel cookware, for whatever reason, is pretty cheap. Even top-flight skillets will only set you back $40-60 or so. Hope you do try the frittata. I think you’d enjoy it. It must be 20 years now that I’ve replaced all of my non-stick cookware with cast iron or enamel. I do have a few non-stick but I use them exclusively for my food styling and not for eating. I like the cast the best, I have one that my husband bought for his first apartment which is so well seasoned, it doesn’t stick at all! This frittata looks amazing, I love the simple ingredients. Plus I have a mound of basil in my garden, it is doing so well. This dish would make a lovely, light supper too. Can’t wait to try it, thanks Frank. Frank you should see my balcony: bursting with basil, oregano and thyme in pots all over … the best is those few precious moments after the rain …. We really keep them growing four seasons and cannot ( do not even try) to skip anything that includes The Trinity, just like salt …. it just needs to be included… Thank you for this reminder how simple things are always the best. Enjoy the week end ! Yes, indeed, simple things really are the best, I agree! Hoping you both have a great weekend.